For 33 years, people have trusted Lightfoot to fix their water heaters in Burleson homes and businesses. When you turn on that faucet and only cold water comes out, give us a call! We’ll figure out what’s gone wrong and let you know what is the best, most economical fix for your problem. There are many things that can go wrong with a water heater. You may have a leaky tank, a pilot light that won’t light, and more. If your hot water goes out, or if you notice that it doesn’t seem to work as well as it used to, call Lightfoot to fix it. We’ll schedule an appointment when it’s a good time for you, and we’ll get there on time. Once we’re there, we’ll listen to your account of the problem, then assess your heater and its components to see what’s not working. When we figure out the problem, we’ll let you know if we recommend repairing or replacing your water heater, and we’ll explain the advantages and disadvantages of every option. We’re always up front about cost, because we know that’s an important factor for you when you’re trying to make the decision that’s best for you and your family. We’ll help you figure out how to spend the least amount of money for the most gain. If you need a new water heater, you have a couple options to choose from. 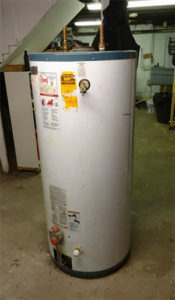 Many people rely on conventional water heaters with tanks. These represent the way water has been heated in homes for many years. They’re available in gas or electric versions, depending on what hookups you have in your home and what you prefer. We will help you choose the right size conventional water heater for your home, based on the size of the home, how many people live there, and how many appliances you have that utilize hot water. If you don’t like conventional water heaters or want to save money on your energy bills, we also install tankless water heaters. These heat the water as it is needed, rather than heating quite a bit of water and storing it in tanks until it gets used. While these water heaters usually cost more money up front, they use less energy to run and, therefore, often represent a significant savings in energy. You may not be sure which option is best for you. That’s ok! We know that you want to make the best choice for your family. We’ll determine which options might work well for you, explain the differences in price and technology, and honor whatever choice you ultimately make. If you need some guidance along the way, we’re happy to answer your questions. We want you to be happy with your water heater, no matter which type you choose. That’s why an expert plumber in Burlson TX will make sure everything is working well in your home before they leave. When we’re done working on your water heater, we want to leave you relieved and stress-free.